Today 23 Kred Leaders from across the globe are assembling at Kred Headquarters in San Francisco to discuss influence for social good – and we want you to be part of the conversation. #YouMatter creator Angela Maiers, InvisiblePeople.tv founder Mark Horvath, global business celebrity Jeffrey Hayzlett, HARO founder <a href=”http://londoncalling.co/wp-content/uploads/Peter” Shankman” target=”_blank”>Peter Shankman, Intel social media strategist Ekaterina Walter, country music journalist Jessica Northey, the lovely Lori Moreno, travel expert Ann Tran, and many more. 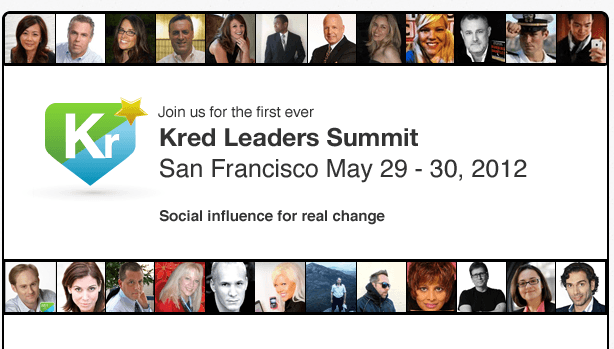 Follow the hashtag #KredCrew to participate in the Kred Leaders Summit, starting at 11am Pacific / 2pm Eastern on Tuesday, May 29 and Wednesday, May 30. The Kred Leaders will share tips for activating social audiences, tell their personal success stories, and provide insights on how you can use your influence for good. Ask questions by tweeting with the hashtag #KredCrew and check the Kred Leaders Summit Leaderboard throughout the event to see your influence. What topics you would like the Kred Leaders to address? Tell us on Twitter or Facebook or by sending us an email.